Giant humans are threatening the planet. As men and women become taller with each generation, they are consuming more and more of the earth's scarce resources, a U.S. scientist warns. 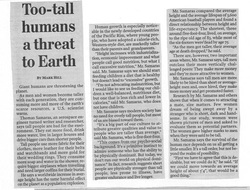 Thomas Samaras, an aerospace engineer turned writer and researcher, says tall people are bad for the environment. They eat more food, drink more water, live in larger houses, and drive bigger cars than shorter people. Tall people use more fabric for their clothes, more leather for their belts and watchbands and more gold for their wedding rings. They consume more soap and water in the shower, require bigger airplanes when travelling and need larger coffins for their burial. He says a worldwide increase in average height has the same harmful effect on the planet as a population explosion. Human growth is especially noticeable in the newly developed countries of the Pacific Rim, where young people who have adopted a calorie-rich, Western-style diet, are markedly taller than their parents and grandparents. "Height increases with industrialization, economic improvement and what people call good nutrition, but what I call excessive nutrition," Samaras says. Samara says we should start feeding children a diet that is healthy but doesn't lead to "excessive" growth. "I'm not advocating malnutrition, but I would like to see us feeding our children a well-balanced, nutritious diet, but one that is less rich and lower in calories," says Mr. Samaras who does not have children. 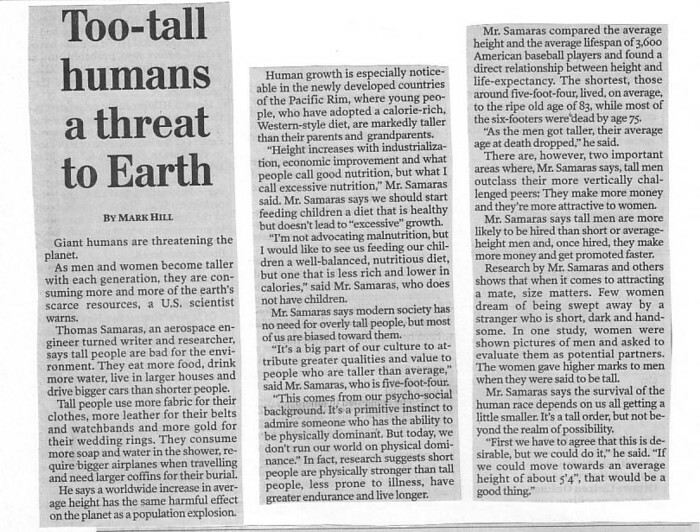 Mr. Samaras says modern society has no need for overly tall people, but most of us are biased toward them. "It's a big part of our culture to attribute greater qualities and value to people who are taller than average," says Mr. Samaras, who is five-foot-four. "This comes from our psycho-social background. It's a primitive instinct to admire someone who has the ability to be physically dominant. But today, we don't run our world on physical dominance." In fact, research suggests short people are physically stronger than tall people, less prone to illness, have greater endurance and live longer. Mr. Samaras compared the average height and the average lifespan of 3,600 American baseball players and found a direct relationship between height and life-expectancy. The shortest, those around five-foot-four, lived, on average, to the ripe old age of 83, while most of the six-footers were dead by age 75. "As the men got taller, their average age at death dropped" he says. There are, however, two important areas where, Mr. Samaras says, tall men outclass their more vertically challenged peers: They make more money and they're more attractive to women. Mr. Samaras says tall men are more likely to be hired than short or average-height men and, once hired, they make more money and get promoted faster. Research by Mr. Samaras and others shows that when it comes to attracting a mate, size matters. Few women dream of being swept away by a stranger who is short, dark and handsome. In one study, women were shown pictures of men and asked to evaluate them as potential partners. The women gave higher marks to men when they were said to be tall. Mr. Samaras says the survival of the human race depends on us all getting a little smaller. It's a tall order, but not beyond the realm of possibility. "First we have to agree that this is desirable, but we could do it," he says. "If we could move towards an average height of about 5'4", that would be a good thing."